Since the same word aionios (eternal in English), is used of both sinners and the righteous, they conclude that the punishment must be just as eternal as "life" is. However, we have assumed that the words 'eternal punishment' means unending torment. The text says nothing of the sort. Death that lasts forever can also fall into the category of "eternal punishment'. Note how the book of Hebrews speaks of "eternal judgment" then, just three chapters later, speaks of "eternal redemption". Redemption itself was a once and for all happening 2000 years ago. The result of the redemption continues on forever. Similarly, you are judged just once, but the results of the judgment last forever. Christians understand that the first part of the message is not to be taken literally - Jesus was not telling us to dismember ourselves or gouge our eyes out but was, very graphically, emphasizing the seriousness of sin. Why then is the second half of the message assumed to be literal? In any case a literal interpretation flatly contradicts maNy, many other passages that specifically say sinners die, perish, rot, decay etc. In one of His messages the Savior warned that the most men can do is to destroy the body, but God is able to destroy both soul and body in Gehenna. Even John 3:16, one of the best known, and most comforting, verses in the Bible, is one of the clearest verses about the fate of unredeemed sinners. When John says believers should not "perish", the obvious implication is that unbelievers do. Paul said that those who do not obey the gospel "will pay the penalty of eternal destruction"and if Christ had not been raised then believers have perished. 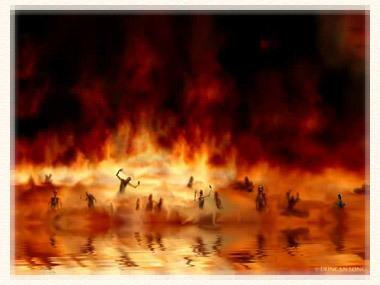 If an everlasting hell were true, then perish would actually mean 'never perish'. It is particularly noteworthy that the Bible frequently speaks of spiritual enlightenment as "life" and spiritual darkness as "death." Jesus told a potential disciple, "Follow me, and let the dead (Gk. nekros) bury their own dead (Gk. nekros) " (Matthew 8:22). He also told the church in Sardis, "'I know your deeds, that you have a name that you are alive, but you are dead (Gk. nekros)." (Revelation 3:1). Paul told the Ephesians that were once dead (Gk. nekros) in their trespasses and sins, (Ephesians 2:1). Later on he said "For this reason it says, "Awake, sleeper, and arise from the dead (Gk. nekros), and Christ will shine on you." Nekros means a 'corpse' or 'dead'. The word necropolis stems from the Ancient Greek nekropolis that literally means "city of the dead". It once referred to ancient cemeteries with elaborate tombs but is even now sometimes applied to modern planned city cemeteries. Necromancy is the practice of supposed communicating with the deceased especially in order to predict the future. Necrophilia is a sexual attraction or act involving corpses. And, I guess John was very mistaken - Lazarus wasn't dead at all. Several verses in Acts use the related word diaphthora when speaking of how David died and decayed in a grave, but Christ the 'Holy One' did not. What is noteworthy about this last verse is that eternal life is set in opposition to corruption. You do not live forever in an eternal hell, but decay and perish. So when Paul wrote "the wages of sin is death (Gk. thanatos)" (Romans 6:23), he must have been hopelessly confused, because the wages of sin is not death but eternal life in hell. (How exactly someone can transform 'death' into 'eternal life in hell' is well beyond me). But here is what is interesting. Every single time the word Hades appears in the New Testament, it is translated into "hell" in the KJV and left untranslated in the ASV, except for 1 Corinthians 15:55 where it is rendered "death" or "grave". ASV: O death (Gr. thanatos), where is thy victory? O death (Gr. Hades), where is thy sting? KJV: O death (Gr. thanatos), where is thy sting? O grave (Gr. Hades), where is thy victory? NIV: Where, O death (Gr. thanatos), is your victory? Where, O death (Gr. Hades), is your sting?" The translators were apparently reluctant to use the original Greek 'Hades" or even translate it into 'hell, because they were under the impression that Hades/hell is an everlasting place of punishment and no one in their right mind could claim victory over a place that will last forever. In summary, the resurrection of believers is a victory over death itself and, in a manner of speaking, a victory over Sheol/Hades as the place of the dead. However the Bible doesn't speak of dying once which is bad enough, but it also says the unredeemed die twice. Okay, so we all know that our bodies decay but aren't our soul immortal as many, if not most, Christians seem to believe? If I had penny for each person that believed that the soul is immortal and survives the death of the body, I would be a very rich woman. In fact, one or another version of an "immortal soul" is found among almost all religions today. The theory of reincarnation believes that souls are reborn in new bodies, which is a whole other topic. Although people can get pretty dogmatic in their opinions, the fact remains that we do not know exactly what being "in God's image" means. All we can be certain of is that since God does not have a physical body we cannot be patterned after His physical likeness. The rest is opinion and conjecture. Certainly it is possible that our emotions, our ability to love etc. may be examples of how we are made in God's image. However, it would serve us well to remember that the Scriptures never once say, nor even imply, that the soul immortal and imperishable. Yet, if you boil it down most of the church, assuming that the idea has it's origins in the Bible, believes that "everyone has eternal life; it's only a matter of where each will spend it." Much to the contrary, Paul very clearly states that God alone possesses immortality. Note the question asked of Jesus in Matthew 19:16. The man was asking what he had to do to get eternal life, not what he had to do to ensure he spent it in a good place. In Matthew 19 Jesus told His disciples that only those who have put Christ before worldly attachments would inherit eternal life. The word "inherit", clearly indicates that we are not born with an immortal soul. In innumerable passages, the Bible clearly states that eternal life is a result of redemption. Those who don't follow and obey the Son "will not see life..."
Finally, 1 Corinthians 15:53-54 teaches that the redeemed will not become immortal until the time of their resurrection. In other words, immortality is conditional, depending upon one's acceptance of Christ. It is a gift of God which He gives to the redeemed when they are resurrected. The idea of an immortal soul predated Christianity and was very common among many nations especially the ancient Egyptians. The Egyptian Book of the Dead, consisted of a number of magic spells, charms, passwords, etc. intended to assist a dead person's journey through underworld and into the afterlife. These were necessary to aid the dead person's spirit to "pass" numerous tests, or be forever in limbo. The Greeks adopted the Egyptian ideas of immortality and an afterlife. Plato, an ancient Greek philosopher wrote the Phaedo around 60 B..E. in which he argues in favor of the soul outliving the body. .
 On the Resurrection of the Flesh. Chapter III.—Some Truths Held Even by the Heathen.